‘A Fair Cop Stands Up’ is enjoying a sell-out run this August. Due to high demand an extra show has been added at 14:40 on the 24th August. 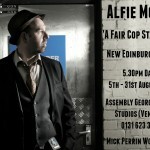 The police-based comedy show draws on Alfie Moore’s eighteen years experience as a police officer, his concerns about the creeping privatisation and dismantling of the ‘finest police service in the world’ and the dilemma he faces in 11 months time whether to resume his police career. For a laughter-filled but thought-provoking hour snap up your tickets and come and say hello, hello, hello to Fair Cop Alfie.